If this post were structured like a real how-to, Step 1 would be to turn off the television. Or in our case, never turn it on. Whether we want to write, read, paint, sculpt, or meditate, there is no better step than that. What we are aiming to do here is to create a sanctuary, an oasis of civilization. 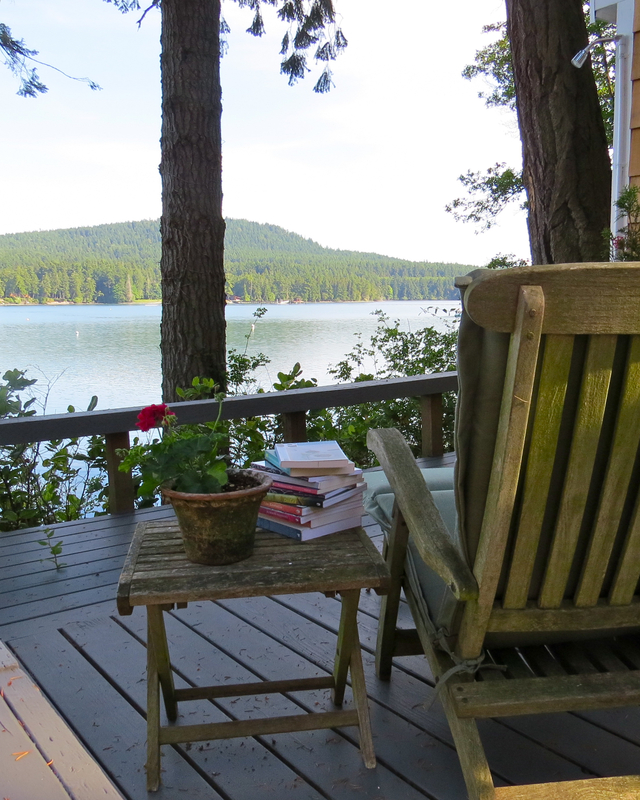 What Gordon Lish referred to as “a haven in a heartless world.” In our case a writing retreat, and this is our attempt at that using our house. And upon a lot in an old growth forest by the sea, there sat a modular Timberland Home, circa 1997, which we redesigned in sustainable materials to be in harmony with nature. Down went LP siding, up went cedar shake shingles. Down came numerous interior walls, and up came generous open space living. Everything opens to sky and sea; we knew nothing should detract from that. It’s the shimmering waters. It’s the quality of air. It’s the wildlife. It’s the quiet. It’s the organic foods. It’s having as many outdoor spaces as in. It’s the reverence for nature. And if you ask me, it’s to be shared. So I invited a writer friend to live with us. (note: this step has to be as important as no television). Dear friend, brilliant writer. He too is finishing a book. Together we imitate graduate school here: writing days, and long walks. Good food, discussions, books, and sometimes reading aloud at night what had been written by day. Suddenly all this nature and art. It was working for me. I know this to be true because he went away for a couple days and I could barely tap out this piece. So? Your husband is also a writer? The pedagogy of creating the writer and finding a space…..
John Irvin liked to throw you to the mats and wrestle a bottle of Single malt Scotch. Creative process counts on many paths……..